After saving projector settings to an SD card, you can transfer them to another projector of the same model. Note: Make sure the SD card contains only one settings transfer file from another projector of the same model. The settings are contained in a file called pjconfdata.bin. If the drive contains other files, the transfer may not complete correctly. Do not adjust image settings on a projector until after you transfer settings to it. Otherwise, you may have to repeat your adjustments. Note: Insert the SD card directly into the projector. Do not use a hub or your settings may not transfer correctly. 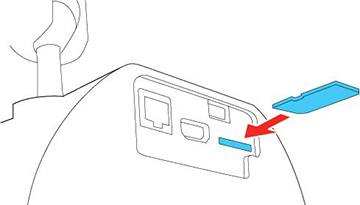 Press and hold the Menu button on the remote control as you connect the power cord to the projector's power inlet. When the On/Standby and Status lights are blue, and the Laser and Temp lights are orange, release the Menu button. The lights flash as settings transfer to the SD card. When the lights stop flashing, the On/Standby light turns blue and the projector enters standby mode.